Students, faculty, and administrators reflected on the Undergraduate Research Opportunities Program's role at MIT and made predictions about the future at the program's twentieth anniversary celebration on Monday. UROP was founded during the 1969-70 academic year by Dean for Undergraduate Education Margaret L. A. MacVicar '65. Twenty years later, it is the "largest, most successful and most well-known program of its kind," said Norma McGavern, director of the Undergraduate Education Office. The centerpiece of Monday's festivities was student and faculty predictions about the year 2020. These predictions were solicited "to get people thinking and to have some fun," MacVicar told The Boston Globe. William Ching '93 speculated that "robots with human capabilities will assist in everyday life" and "cancer will be eradicated." Cold fusion and advanced computer capabilities would solve the energy crisis, according to Gautam Ramakarishna '93. "Biological immortality" would be achieved, Greg Bettinger '91 predicted. As for MIT, the year 2020 may see the Institute's own space research lab so that, "in addition to the semester abroad program in another country, there will be a semester abroad program for the space station," Andrew Dickson '93 wrote. Mohanjit Jolly '91 speculated that "departments of sciences such as biology and chemistry will suffer due to increasing emphasis on engineering-only policy at MIT." UROP itself "will expand tremendously" by 2020 because "students are willing learners and motivated workers," Christina Kwon '92 predicted. Moreover, according to Bettinger, the program will "play a crucial role in integrating students into areas of high-tech industry." Because of the program's flexibility, which "allows people to [take on a project] when they are ready, when they want, and for as long as they want," McGavern seemed certain that UROP would still be "thoroughly woven into" the undergraduate experience in the year 2020. UROP has been successful, and will continue to be successful, because it "taps into MIT's real strength," McGavern said. The program draws upon the high quality of faculty members, their involvement in research and their interest in undergraduate education, she explained. The flexibility of the program is also crucial to UROP's success, according to McGavern. "Students at MIT are too diverse to fit into a cookie-cutter program," she explained. UROP participation ranges between one half and one third of undergraduates, and since a program as "sound as UROP is unlikely to change substantially," McGavern expected this high level of participation to continue. No intensive re-evaluation or revision of UROP is planned, she said. Instead, "adjustments to the program occur all the time," in a process which is "evolutionary, not revolutionary," she stressed. Honorary Chairman of the Corporation Howard W. Johnson, who was president of the Institute when the program began, reflected on "the sense of anticipation we all felt about the useful dynamics of the proposed program." He credited UROP with helping "to revolutionize education for undergraduates at MIT" and creating "large-scale reverberations in the world of education in general." 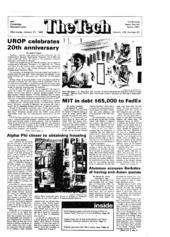 During the ceremony on Monday, the predictions were sealed in a time capsule, which will be stored at the MIT Museum until it is opened at the celebration of UROP's fiftieth anniversary in 2020. The program provides students with "an opportunity to feel like a participant in the great adventure of science and technology rather than a student plodding along on an aimless road without a visible end," according to Whiitaker Professor of Biomedical Engineering Robert W. Mann. UROP emphasizes the [practical applications/particpatory aspect] of eductaion by forcing students "to critically examine the signifigance, validity and consequences of what we've done in lab," blah blah O'Handley said. It helps "to change vague thoughts, expectations, intuitons, into defensible arguments," he added.